The year: 1981. New York City is in the middle of one of its worst periods for violent crime. Other changes are happening, as well. It’s a time — not entirely unlike our own — when the line between legitimacy and illegitimacy seems to have blurred, and ethics appear to have become variable. How bad would it really be if a burgeoning business fudged a bit on its taxes? How far should one go in an attempt to outdo one’s competition? And in the world of urban business, how do things begin to shake out when new ethnic groups start to assert their dominance? Can there be room for new kids on the block? A Most Violent Year — the drama that encompasses all these questions — demonstrates how big issues can be found by narrowing and sharpening one’s focus. Directed by J.C. Chandor, A Most Violent Year revolves around a business that delivers home heating oil in New York City. Within this narrow gauge, Chandor — aided by a terrific cast — has made a rare and quietly compelling movie that’s willing to examine how people try to reconcile ambition and morality. Chandor (Margin Call and All Is Lost) focuses on Abel Morales, played by Oscar Isaac. Abel wants to expand his footprint in the heating oil business. To accomplish his goal, he decides to buy several storage tanks owned by a Hasidic Jewish family that drives a hard bargain. Abel must make a large cash down payment and come up the rest of the money — another $1.5 million — within 30 days. If he can’t, he loses his down payment and his business along with it. The scene in which Abel and his attorney make the deal is a rich one. The sellers are careful to point out that what they’re asking could have devastating consequences for Abel. He’s set his mind on the purchase, and won’t be deterred. He likes to own the things he uses, he says. As is the case with many scenes in A Most Violent Year, the drama is carefully developed, even understated, and unlike many movies I see, I believed every moment of it. Chandor allows the tension in Abel’s situation to emerge through the performances and through the establishment of a dreary slice of urban winter. Last seen in Inside Llewyn Davis, Isaac proves masterful as a well-dressed businessman who says he’s trying to operate in legitimate fashion. It’s not always clear where Abel is willing to draw the line that will keep him from felonious behavior. That’s because Abel doesn’t arrive on screen in prefabricated form; he’s in the process of picking his way through a tough world while keeping as much of his integrity as possible. A man of pride, composure and impeccable dress, Abel’s a commanding figure in his camel-colored overcoat. In one of her best performances yet, Jessica Chastain plays Abel’s wife Anna, the daughter of a Mafia don. Anna wonders whether her husband — for all his attempts to control everything — has the right stuff to make his way in a business environment in which someone is hijacking his trucks and stealing his oil. She wants Abel to bring her family into the mix. Abel refuses. Abel’s nothing if not determined, but Anna seems the tougher of the two. Everything about her suggests that she understands more about the way the world works than her husband. He doesn’t want to be defined as a gangster. That’s less of a problem for Anna. The supporting players are all in fine form. Two are especially noteworthy: Albert Brooks plays Abel’s morally dubious attorney, a man whose face shows the wear of a career spent making deals that probably were ethically challenged. David Oyelowo — currently on views as Dr. Martin Luther King in Selma — portrays a district attorney who’s investigating the heating oil business, using Abel’s company as a target. When you’re expecting to borrow big money from a bank — as Abel is — a criminal investigation isn’t exactly what you want on your resume. As the story develops, Abel’s forced to juggle any number of balls. Drop even one and he could be ruined. Working with cinematographer Bradford Young, Chandor creates an urban environment that gives A Most Violent Year the feel and texture of a crime drama. 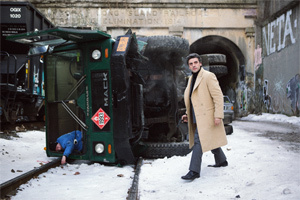 Some reviewers have likened A Most Violent Year to a Sidney Lumet movie. It’s an apt enough comparison, although Chandor’s style tends to be less teeming and comprehensive than the approach the late Lumet took in movies such as Serpico, Prince of the City, Dog Day Afternoon and Q & A. Still, the fact that Chandor is continuing this tradition at all strikes me as worthy, honorable and important. In the end, the honorable man does what’s most right. Maybe that’s all he can do.